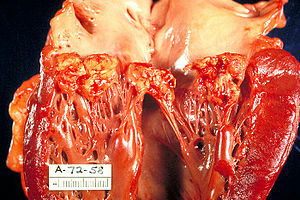 Infective endocarditis is an infection of the inner surface of the heart, usually the valves. Symptoms may include fever, small areas of bleeding into the skin, heart murmur, feeling tired, and low red blood cell count. Complications may include valvular insufficiency, heart failure, stroke, and kidney failure. A mitral valve vegetation caused by bacterial endocarditis. The cause is typically a bacterial infection and less commonly a fungal infection. Risk factors include valvular heart disease including rheumatic disease, congenital heart disease, artificial valves, hemodialysis, intravenous drug use, and electronic pacemakers. The bacteria most commonly involved are streptococci or staphylococci. Diagnosis is suspected based on symptoms and supported by blood cultures or ultrasound. There is also a noninfective form of endocarditis. The usefulness of antibiotics following dental procedures for prevention is unclear. Some recommend them in those at high risk. Treatment is generally with intravenous antibiotics. The choice of antibiotics is based on results of blood cultures. Occasionally heart surgery is required. The number of people affected is about 5 per 100,000 per year. Rates, however, vary between regions of the world. Males are affected more often than females. The risk of death among those infected is about 25%. Without treatment it is almost universally fatal. Fever occurs in 97% of people; malaise and endurance fatigue in 90% of people. A new or changing heart murmur, weight loss, and coughing occurs in 35% of people. Vascular phenomena: septic embolism (causing thromboembolic problems such as stroke or gangrene of fingers), Janeway lesions (painless hemorrhagic cutaneous lesions on the palms and soles), intracranial hemorrhage, conjunctival hemorrhage, splinter hemorrhages, kidney infarcts, and splenic infarcts. Many microorganisms can cause infective endocarditis. These are generally isolated by blood culture, where the patient's blood is drawn and any growth is noted and identified. The term bacterial endocarditis (BE) commonly is used, reflecting the fact that most cases of IE are due to bacteria; however, infective endocarditis (IE) has become the preferred term. Staphylococcus aureus followed by Streptococci of the viridans group and coagulase negative Staphylococci are the three most common organisms responsible for infective endocarditis. Other Streptococci and Enterococci are also a frequent cause of infective endocarditis. HACEK group of microorganisms and fungi are seen less frequently in North America. The viridians group include S. oralis, S. mitis, S. sanguis, S. gordonii and S. parasanguis. The primary habitats for these organisms are oral cavity and upper respiratory tract. These bacteria are present in the normal oral flora and enter the bloodstream usually by dental surgical procedures (tooth extractions) or genitourinary manipulation; as such, dental surgeons must fully carry out protective and preventive measures. In some countries e.g. the USA, high risk patients may be given prophylactic antibiotics such as penicillin or clindamycin for penicillin allergic patients prior to dental procedures. Prophylactics should be bactericidal rather than bacteriostatic. Such measures are not taken in certain countries e.g. Scotland due to the fear of antibiotic resistance. Because bacteria is the most common cause of infective endocarditis (especially Streptococci), antibiotics such as penicillin and amoxycillin (for beta lactamase bacteria) are used in prophylaxis. Micriobiological culture could also be used to identify the infecting organism and testing its sensivitiy to different types of antibiotics. Viridans alpha-hemolytic streptococci, that are present in the mouth, are the most frequently isolated microorganisms when the infection is acquired in a community setting. In contrast, Staphylococcus blood stream infections are frequently acquired in a health care setting where they can enter the blood stream through procedures that cause break in the integrity of skin, such as surgery, catheterisation, or during access of long term indwelling catheters or secondary to intravenous injection of recreational drugs. Enterococcus can enter the bloodstream as a consequence of abnormalities in the gastrointestinal or genitourinary tracts. Some organisms, when isolated, give valuable clues to the cause, as they tend to be specific. Pseudomonas species, which are very resilient organisms that thrive in water, may contaminate street drugs that have been contaminated with drinking water. P. aeruginosa can infect a child through foot punctures, and can cause both endocarditis and septic arthritis. S. bovis and Clostridium septicum, which are part of the natural flora of the bowel, are associated with colonic malignancies. When they present as the causative agent in endocarditis, it usually calls for a colonoscopy to be done immediately due to concerns regarding hematogenous spread of bacteria from the colon due to the neoplasm breaking down the barrier between the gut lumen and the blood vessels which drain the bowel. HACEK organisms are a group of bacteria that live on the dental gums, and can be seen with IV drug users who contaminate their needles with saliva. Patients may also have a history of poor dental hygiene, or pre-existing valvular disease. Less commonly reported bacteria responsible for so called "culture negative endocarditis" include Bartonella, Chlamydia psittaci, and Coxiella. Such bacteria can be identified by serology, culture of the excised valve tissue, sputum, pleural fluid, and emboli, and by polymerase chain reaction or sequencing of bacterial 16S ribosomal RNA. Multiple case reports of infective endocarditis caused by unusual organisms have been published. Propionibacterium sp., which are normal skin flora, have been responsible for infective endocarditis sometimes leading to deaths due to the indolent course of this abscess producing infection.Tropheryma whipplei has caused endocarditis without gastrointestinal involvement. Citrobacter koseri was found in an immunocompetent adult. Neisseria bacilliformis was found in a patient with a bicuspid aortic valve. Candida albicans is found as a spherical or oval budding yeast. It is associated with endocarditis in IV drug users, patients with prosthetic valves, and immunocompromised patients. It forms biofilms around thick-walled resting structures like prosthetic heart valves and additionally colonizes and penetrates endothelial walls. C. albicans is responsible for 24-46% of all the cases of FE, and its mortality rate is 46.6–50%. Other fungi demonstrated to cause endocarditis are Histoplasma capsulatum and Aspergillus. Aspergillus contributes to roughly 25% of FE cases. Endocarditis with Tricosporon asahii has also been reported in a case report. More detailed descriptions of these and other risk factors are provided below. Other conditions that result in large numbers of bacteria entering into the bloodstream include colorectal cancer (mostly Streptococcus bovis), serious urinary tract infections (mostly enterococci), and drug injection (Staphylococcus aureus). With a large number of bacteria, even a normal heart valve may become infected. A more virulent organism (such as Staphylococcus aureus) can cause infective endocarditis by infecting even a normal heart valve. Intravenous drug users tend to get their right-sided heart valves infected because the veins that are injected drain into the right side of the heart. In rheumatic heart disease, infection occurs on the aortic and the mitral valves on the left side of the heart. Other factors that increase the risk of developing infective endocarditis are low levels of white blood cells, immunodeficiency or immunosuppression, malignancy, diabetes mellitus, and alcohol abuse. In the past, one in eight cases of infective endocarditis were because of bacteremia caused by dental procedures (in most cases due to Streptococcus viridans, which reside in the oral cavity), such as a cleaning or extraction of a tooth; this was thought to be more clinically significant than it actually was. However, it is important that a dentist or a dental hygienist be told of any heart problems before commencing treatment. Antibiotics are administered to patients with certain heart conditions as a precaution, although this practice has changed in the US, with new American Heart Association guidelines released in 2007, and in the UK as of March 2008 due to new NICE guidelines. Everyday tooth brushing and flossing will similarly cause bacteremia, so a high standard of oral health should be adhered to at all times. Although there is little evidence to support antibiotic prophylaxis for dental treatment, the current American Heart Association guidelines are highly accepted by clinicians and patients. Damaged valves and endocardium contribute to the development of infective endocarditis. Specifically, the damaged part of a heart valve forms a local blood clot, a condition known as non-bacterial thrombotic endocarditis (NBTE). The platelet and fibrin deposits that form as part of the blood clotting process allow bacteria to take hold and form vegetations. As previously mentioned, the body has no direct methods of combating valvular vegetations because the valves do not have a dedicated blood supply. This combination of damaged valves, bacterial growth, and lack of a strong immune response results in infective endocarditis. Altered, turbulent blood flow. The areas that fibrose, clot, or roughen as a result of this altered flow are known as jet lesions. Altered blood flow is more likely in high pressure areas, so ventricular septal defects or patent ductus arteriosus can create more susceptibility than atrial septal defects. Catheters, electrodes, and other intracardiac prosthetic devices. Solid particles from repeated intravenous injections. Chronic inflammation. Examples include auto-immune mechanisms and degenerative valvular lesions. The risk factors for infective endocarditis provide a more extensive list of conditions that can damage the heart. Vegetation on the tricuspid valve by echocardiography. Arrow denotes the vegetation. In general, the Duke criteria should be fulfilled in order to establish the diagnosis of endocarditis. The blood tests C reactive protein (CRP) and procalcitonin have not been found to be particularly useful in helping make or rule out the diagnosis. As the Duke criteria rely heavily on the results of echocardiography, research has addressed when to order an echocardiogram by using signs and symptoms to predict occult endocarditis among patients with intravenous drug abuse and among non drug-abusing patients. However, this research is over twenty years old and it is possible that changes in the epidemiology of endocarditis and bacteria such as staphylococci make the following estimates incorrect. The transthoracic echocardiogram has a sensitivity and specificity of approximately 65% and 95% if the echocardiographer believes there is 'probable' or 'almost certain' evidence of endocarditis. Among people who do not use intravenous drugs and have a fever in the emergency department, there is a less than 5% chance of occult endocarditis. Mellors in 1987 found no cases of endocarditis nor of staphylococcal bacteremia among 135 febrile patients in the emergency room. The upper confidence interval for 0% of 135 is 5%, so for statistical reasons alone, there is up to a 5% chance of endocarditis among these patients. In contrast, Leibovici found that among 113 non-selected adults admitted to the hospital because of fever there were two cases (1.8% with 95%CI: 0% to 7%) of endocarditis. Among people who do use intravenous drugs and have a fever in the emergency department, there is about a 10% to 15% prevalence of endocarditis. This estimate is not substantially changed by whether the doctor believes the patient has a trivial explanation for their fever. Weisse found that 13% of 121 patients had endocarditis. Marantz also found a prevalence of endocarditis of 13% among such patients in the emergency department with fever. Samet found a 6% incidence among 283 such patients, but after excluding patients with initially apparent major illness to explain the fever (including 11 cases of manifest endocarditis), there was a 7% prevalence of endocarditis. Among people with staphylococcal bacteremia (SAB), one study found a 29% prevalence of endocarditis in community-acquired SAB versus 5% in nosocomial SAB. However, only 2% of strains were resistant to methicillin and so these numbers may be low in areas of higher resistance. Historically, infective endocarditis has been clinically divided into acute and subacute presentations (because untreated patients tended to live longer with the subacute as opposed to the acute form). This classifies both the rate of progression and severity of disease. Subacute bacterial endocarditis (SBE) is often due to streptococci of low virulence (mainly viridans streptococci) and mild to moderate illness which progresses slowly over weeks and months (>2 weeks) and has low propensity to hematogenously seed extracardiac sites. Acute bacterial endocarditis (ABE) is a fulminant illness over days to weeks (<2 weeks), and is more likely due to Staphylococcus aureus which has much greater virulence, or disease-producing capacity and frequently causes metastatic infection. This classification is now discouraged, because the ascribed associations (in terms of organism and prognosis) were not strong enough to be relied upon clinically. The terms short incubation (meaning less than about six weeks) and long incubation (greater than about six weeks) are preferred. Infective endocarditis may also be classified as culture-positive or culture-negative. By far the most common cause of a "culture-negative" endocarditis is prior administration of antibiotics. Sometimes microorganisms can take a longer period of time to grow in the culture media, such organisms are said to be fastidious because they have demanding growth requirements. Some examples include pathogens like Aspergillus species, Brucella species, Coxiella burnetii, Chlamydia species, and HACEK bacteria. Due to delay in growth and identification in these cases, patients may be erroneously classified as "culture-negative" endocarditis. Patients who intravenously inject opioids such as heroin or methamphetamine may introduce infection which can travel to the right side of the heart, classically affecting the tricuspid valve, and most often caused by S. aureus. Regardless of cause, left-sided endocarditis is more common in both IV drug users and non-drug users than right-sided endocarditis. Another form of endocarditis is healthcare-associated endocarditis when the infecting organism is believed to be transmitted in a health care setting like hospital, dialysis unit or a residential nursing home. Nosocomial endocarditis is a form of healthcare associated endocarditis in which the infective organism is acquired during a stay in a hospital and it is usually secondary to presence of intravenous catheters, total parenteral nutrition lines, pacemakers, etc. Finally, the distinction between native-valve endocarditis and prosthetic-valve endocarditis is clinically important. Prosthetic valve endocarditis can be early (< 60 days of valvular surgery), intermediate (60 days to 1 year) or late (> 1 year following valvular surgery). Early prosthetic valve endocarditis is usually due to intraoperative contamination or a postoperative bacterial contamination which is usually nosocomial in nature. Late prosthetic valve endocarditis is usually due to community acquired microorganisms. Prosthetic valve endocarditis is commonly caused by Staphylococcus epidermidis as it is capable of growing as a biofilm on plastic surfaces. In the UK, NICE clinical guidelines no longer advise prophylaxis because there is no clinical evidence that it reduces the incidence of IE and there are negative effects (e.g. allergy and increased bacterial resistance) of taking antibiotics that may outweigh the benefits. Antibiotics were historically commonly recommended to prevent IE in those with heart problems undergoing dental procedures (known as dental antibiotic prophylaxis). There is, however, insufficient evidence to support whether antibiotics are effective or ineffective at preventing IE when given prior to a dental procedures in people at high risk. They are less commonly recommended for this procedure. High-dose antibiotics are administered by the intravenous route to maximize diffusion of antibiotic molecules into vegetation(s) from the blood filling the chambers of the heart. This is necessary because neither the heart valves nor the vegetations adhering to them are supplied by blood vessels. Antibiotics are typically continued for two to six weeks depending on the characteristics of the infection and the causative microorganisms. In acute endocarditis, due to the fulminant inflammation, empirical antibiotic therapy is started immediately after the blood has been drawn for culture. This usually includes vancomycin and ceftriaxone IV infusions until the microbial identification and susceptibility report with the minimum inhibitory concentration becomes available allowing for modification of the antimicrobial therapy to target the specific microorganism. It should be noted that the routine use of gentamicin to treat endocarditis has fallen out of favor due to the lack of evidence to support its use (except in infections caused by Enterococcus and nutritionally variant streptococci) and the high rate of complications. In subacute endocarditis, where the patient's hemodynamic status is usually stable, antibiotic treatment can be delayed until the causative microorganism can be identified. The most common organism responsible for infective endocarditis is Staphylococcus aureus, which is resistant to penicillin in most cases. High rates of resistance to oxacillin are also seen, in which cases treatment with vancomycin is required. Viridans group streptococci and Streptococcus bovis are usually highly susceptible to penicillin and can be treated with penicillin or ceftriaxone. Relatively resistant strains of viridans group streptococci and Streptococcus bovis are treated with penicillin or ceftriaxone along with a shorter two-week course of an aminoglycoside during the initial phase of treatment. Highly penicillin-resistant strains of viridans group streptococci, nutritionally variant streptococci like Granulicatella sp., Gemella sp. and Abiotrophia defectiva, and Enterococci are usually treated with a combination therapy consisting of penicillin and an aminoglycoside for the entire duration of 4–6 weeks. Additionally, oxacillin-susceptible Staphylococcus aureus native valve endocarditis of the right side can also be treated with a short 2-week course of a beta-lactam antibiotic such as nafcillin with or without aminoglycosides. Infection caused by fungi or resistant Gram negative bacteria. The guidelines were recently updated by both the American College of Cardiology and the European Society of Cardiology. There was a recent meta-analysis published that showed surgical intervention at seven days or less is associated with lower mortality PMID 26869640. Infective endocarditis is associated with 18% in-hospital mortality. In developed countries, the annual incidence of infective endocarditis is 3 to 9 cases per 100,000 persons. The male-to-female case ratio is over 2:1. There is an increased incidence of infective endocarditis in persons 65 years of age and older, which is probably because people in this age group have a larger number of risk factors for infective endocarditis. In recent years, over one-third of infective endocarditis cases in the United States were healthcare-associated. Another trend observed in developed countries is that chronic rheumatic heart disease accounts for less than 10% of cases. Although a history of valve disease has a significant association with infective endocarditis, 50% of all cases develop in people with no known history of valvular disease. ^ a b c d e f g h i j k l m n o p q r "Infective Endocarditis – Cardiovascular Disorders". Merck Manuals Professional Edition. September 2017. Retrieved 11 December 2017. ^ a b Njuguna B, Gardner A, Karwa R, Delahaye F (February 2017). "Infective Endocarditis in Low- and Middle-Income Countries". Cardiology Clinics. 35 (1): 153–163. doi:10.1016/j.ccl.2016.08.011. PMID 27886786. ^ a b c d e f g Ambrosioni J, Hernandez-Meneses M, Téllez A, Pericàs J, Falces C, Tolosana JM, Vidal B, Almela M, Quintana E, Llopis J, Moreno A, Miro JM (May 2017). "The Changing Epidemiology of Infective Endocarditis in the Twenty-First Century". Current Infectious Disease Reports. 19 (5): 21. doi:10.1007/s11908-017-0574-9. PMID 28401448. ^ Cahill TJ, Harrison JL, Jewell P, Onakpoya I, Chambers JB, Dayer M, Lockhart P, Roberts N, Shanson D, Thornhill M, Heneghan CJ, Prendergast BD (June 2017). "Antibiotic prophylaxis for infective endocarditis: a systematic review and meta-analysis". Heart. 103 (12): 937–944. doi:10.1136/heartjnl-2015-309102. PMID 28213367. ^ a b Mattu A, Goyal D, Barrett JW, Broder J, DeAngelis M, Deblieux P, Garmel GM, Harrigan R, Karras D, L'Italien A, Manthey D (2007). Emergency medicine: avoiding the pitfalls and improving the outcomes. Blackwell/BMJ Books. p. 63. ISBN 978-1-4051-4166-6. ^ Ferro JM, Fonseca AC (2014). Infective endocarditis. Handbook of Clinical Neurology. 119. pp. 75–91. doi:10.1016/B978-0-7020-4086-3.00007-2. ISBN 9780702040863. PMID 24365290. ^ a b c d e f Mitchell RS, Kumar V, Robbins SL, Abbas AK, Fausto N (2007). Robbins Basic Pathology (8th ed.). Saunders/Elsevier. pp. 406–8. ISBN 978-1-4160-2973-1. ^ a b c Murdoch DR, Corey GR, Hoen B, Miró JM, Fowler VG, Bayer AS, Karchmer AW, Olaison L, Pappas PA, Moreillon P, Chambers ST, Chu VH, Falcó V, Holland DJ, Jones P, Klein JL, Raymond NJ, Read KM, Tripodi MF, Utili R, Wang A, Woods CW, Cabell CH (March 2009). "Clinical presentation, etiology, and outcome of infective endocarditis in the 21st century: the International Collaboration on Endocarditis-Prospective Cohort Study". Archives of Internal Medicine. 169 (5): 463–73. doi:10.1001/archinternmed.2008.603. PMC 3625651. PMID 19273776. ^ a b c d Jeremy., Bagg (2006). Essentials of microbiology for dental students (2nd ed.). Oxford: Oxford University Press. ISBN 9780198564898. OCLC 61756542. ^ "Drug Prescribing". SDCEP. Retrieved 2018-01-25. ^ "Pseudomonas aeruginosa". Topics in Infectious Diseases Newsletter. August 2001. Archived from the original on July 24, 2008. ^ a b Gold JS, Bayar S, Salem RR (July 2004). "Association of Streptococcus bovis bacteremia with colonic neoplasia and extracolonic malignancy". Archives of Surgery. 139 (7): 760–5. doi:10.1001/archsurg.139.7.760. PMID 15249410. ^ Chew SS, Lubowski DZ (November 2001). "Clostridium septicum and malignancy". ANZ Journal of Surgery. 71 (11): 647–9. doi:10.1046/j.1445-1433.2001.02231.x. PMID 11736823. ^ a b Lamas CC, Eykyn SJ (March 2003). "Blood culture negative endocarditis: analysis of 63 cases presenting over 25 years". Heart. 89 (3): 258–62. doi:10.1136/heart.89.3.258. PMC 1767579. PMID 12591823. ^ Clayton JJ, Baig W, Reynolds GW, Sandoe JA (August 2006). "Endocarditis caused by Propionibacterium species: a report of three cases and a review of clinical features and diagnostic difficulties". Journal of Medical Microbiology. 55 (Pt 8): 981–7. doi:10.1099/jmm.0.46613-0. PMID 16849716. ^ Dreier J, Szabados F, von Herbay A, Kröger T, Kleesiek K (October 2004). "Tropheryma whipplei Infection of an acellular porcine heart valve bioprosthesis in a patient who did not have intestinal Whipple's disease". Journal of Clinical Microbiology. 42 (10): 4487–93. doi:10.1128/JCM.42.10.4487-4493.2004. PMC 522317. PMID 15472298. ^ Dzeing-Ella A, Szwebel TA, Loubinoux J, Coignard S, Bouvet A, Le Jeunne C, Aslangul E (December 2009). "Infective endocarditis due to Citrobacter koseri in an immunocompetent adult". Journal of Clinical Microbiology. 47 (12): 4185–6. doi:10.1128/JCM.00957-09. PMC 2786675. PMID 19812281. ^ Masliah-Planchon J, Breton G, Jarlier V, Simon A, Benveniste O, Herson S, Drieux L (June 2009). "Endocarditis due to Neisseria bacilliformis in a patient with a bicuspid aortic valve". Journal of Clinical Microbiology. 47 (6): 1973–5. doi:10.1128/JCM.00026-09. PMC 2691068. PMID 19386832. ^ a b c Jeremy., Bagg (2006). Essentials of microbiology for dental students (2nd ed.). Oxford: Oxford University Press. ISBN 978-0198564898. OCLC 61756542. ^ a b Yuan SM (2016). "Fungal Endocarditis". Brazilian Journal of Cardiovascular Surgery. 31 (3): 252–255. doi:10.5935/1678-9741.20160026. PMC 5062704. PMID 27737409. ^ Izumi K, Hisata Y, Hazama S (October 2009). "A rare case of infective endocarditis complicated by Trichosporon asahii fungemia treated by surgery". Annals of Thoracic and Cardiovascular Surgery. 15 (5): 350–3. PMID 19901894. ^ a b c d e f g h Hoen B, Duval X (April 2013). "Clinical practice. Infective endocarditis". The New England Journal of Medicine. 368 (15): 1425–33. doi:10.1056/NEJMcp1206782. PMC 1539065. PMID 23574121. ^ a b Wilson W, Taubert KA, Gewitz M, Lockhart PB, Baddour LM, Levison M, et al. (October 2007). "Prevention of infective endocarditis: guidelines from the American Heart Association: a guideline from the American Heart Association Rheumatic Fever, Endocarditis, and Kawasaki Disease Committee, Council on Cardiovascular Disease in the Young, and the Council on Clinical Cardiology, Council on Cardiovascular Surgery and Anesthesia, and the Quality of Care and Outcomes Research Interdisciplinary Working Group". Circulation. 116 (15): 1736–54. doi:10.1161/CIRCULATIONAHA.106.183095. PMID 17446442. ^ Zadik Y, Findler M, Livne S, Levin L, Elad S (December 2008). "Dentists' knowledge and implementation of the 2007 American Heart Association guidelines for prevention of infective endocarditis". Oral Surgery, Oral Medicine, Oral Pathology, Oral Radiology, and Endodontics. 106 (6): e16–9. doi:10.1016/j.tripleo.2008.08.009. PMID 19000604. ^ Elad S, Binenfeld-Alon E, Zadik Y, Aharoni M, Findler M (March 2011). "Survey of acceptance of the 2007 American Heart Association guidelines for the prevention of infective endocarditis: a pilot study". Quintessence International. 42 (3): 243–51. PMID 21465012. Archived from the original on 2015-12-22. ^ a b Durack DT, Lukes AS, Bright DK (March 1994). "New criteria for diagnosis of infective endocarditis: utilization of specific echocardiographic findings. Duke Endocarditis Service". The American Journal of Medicine. 96 (3): 200–9. doi:10.1016/0002-9343(94)90143-0. PMID 8154507. ^ Yu CW, Juan LI, Hsu SC, Chen CK, Wu CW, Lee CC, Wu JY (June 2013). "Role of procalcitonin in the diagnosis of infective endocarditis: a meta-analysis". The American Journal of Emergency Medicine. 31 (6): 935–41. doi:10.1016/j.ajem.2013.03.008. PMID 23601504. ^ a b Weisse AB, Heller DR, Schimenti RJ, Montgomery RL, Kapila R (March 1993). "The febrile parenteral drug user: a prospective study in 121 patients". The American Journal of Medicine. 94 (3): 274–80. doi:10.1016/0002-9343(93)90059-X. PMID 8452151. ^ a b Samet JH, Shevitz A, Fowle J, Singer DE (July 1990). "Hospitalization decision in febrile intravenous drug users". The American Journal of Medicine. 89 (1): 53–7. doi:10.1016/0002-9343(90)90098-X. PMID 2368794. ^ a b c Marantz PR, Linzer M, Feiner CJ, Feinstein SA, Kozin AM, Friedland GH (June 1987). "Inability to predict diagnosis in febrile intravenous drug abusers". Annals of Internal Medicine. 106 (6): 823–8. doi:10.7326/0003-4819-106-6-823. PMID 3579068. ^ a b Leibovici L, Cohen O, Wysenbeek AJ (June 1990). "Occult bacterial infection in adults with unexplained fever. Validation of a diagnostic index". Archives of Internal Medicine. 150 (6): 1270–2. doi:10.1001/archinte.150.6.1270. PMID 2353860. ^ a b Mellors JW, Horwitz RI, Harvey MR, Horwitz SM (April 1987). "A simple index to identify occult bacterial infection in adults with acute unexplained fever". Archives of Internal Medicine. 147 (4): 666–71. doi:10.1001/archinte.147.4.666. PMID 3827454. ^ Shively BK, Gurule FT, Roldan CA, Leggett JH, Schiller NB (August 1991). "Diagnostic value of transesophageal compared with transthoracic echocardiography in infective endocarditis". Journal of the American College of Cardiology. 18 (2): 391–7. doi:10.1016/0735-1097(91)90591-V. PMID 1856406. ^ Erbel R, Rohmann S, Drexler M, Mohr-Kahaly S, Gerharz CD, Iversen S, Oelert H, Meyer J (January 1988). "Improved diagnostic value of echocardiography in patients with infective endocarditis by transoesophageal approach. A prospective study". European Heart Journal. 9 (1): 43–53. doi:10.1093/oxfordjournals.eurheartj.a062389. PMID 3345769. ^ a b c "UOTW #27 – Ultrasound of the Week". Ultrasound of the Week. 26 November 2014. Archived from the original on 9 May 2017. Retrieved 27 May 2017. ^ "UOTW #60 – Ultrasound of the Week". Ultrasound of the Week. 5 October 2015. Archived from the original on 9 May 2017. Retrieved 27 May 2017. ^ Li JS, Sexton DJ, Mick N, Nettles R, Fowler VG, Ryan T, Bashore T, Corey GR (April 2000). "Proposed modifications to the Duke criteria for the diagnosis of infective endocarditis". Clinical Infectious Diseases. 30 (4): 633–8. doi:10.1086/313753. PMID 10770721. ^ Kaech C, Elzi L, Sendi P, Frei R, Laifer G, Bassetti S, Fluckiger U (April 2006). "Course and outcome of Staphylococcus aureus bacteraemia: a retrospective analysis of 308 episodes in a Swiss tertiary-care centre". Clinical Microbiology and Infection. 12 (4): 345–52. doi:10.1111/j.1469-0691.2005.01359.x. PMID 16524411. ^ Morris AM (January 2006). "How best to deal with endocarditis". Current Infectious Disease Reports. 8 (1): 14–22. doi:10.1007/s11908-006-0030-8. PMID 16448596. ^ "Prophylaxis against infective endocarditis: Antimicrobial prophylaxis against infective endocarditis in adults and children undergoing interventional procedures". NICE Clinical Guidelines. National Institute for Health Care and Excellence (UK). March 2008. Archived from the original on 2013-01-26. Retrieved 2013-04-30. ^ "Prophylaxis against infective endocarditis: antimicrobial prophylaxis against infective endocarditis in adults and children undergoing interventional procedures". National Institute for Health and Care Excellence (NICE). 2008. ^ Cosgrove SE, Vigliani GA, Fowler VG, Abrutyn E, Corey GR, Levine DP, Rupp ME, Chambers HF, Karchmer AW, Boucher HW (March 2009). "Initial low-dose gentamicin for Staphylococcus aureus bacteremia and endocarditis is nephrotoxic". Clinical Infectious Diseases. 48 (6): 713–21. doi:10.1086/597031. PMID 19207079. ^ a b c d Baddour LM, Wilson WR, Bayer AS, Fowler VG, Bolger AF, Levison ME, et al. (June 2005). "Infective endocarditis: diagnosis, antimicrobial therapy, and management of complications: a statement for healthcare professionals from the Committee on Rheumatic Fever, Endocarditis, and Kawasaki Disease, Council on Cardiovascular Disease in the Young, and the Councils on Clinical Cardiology, Stroke, and Cardiovascular Surgery and Anesthesia, American Heart Association: endorsed by the Infectious Diseases Society of America". Circulation. 111 (23): e394–434. doi:10.1161/CIRCULATIONAHA.105.165564. PMID 15956145. ^ Kalavakunta JK, Davenport DS, Tokala H, King A, Khagny M, Gupta V (January 2011). "Destructive Abiotrophia defectiva endocarditis". The Journal of Heart Valve Disease. 20 (1): 111–2. PMID 21404910. ^ Bonow RO, Carabello BA, Chatterjee K, de Leon AC, Faxon DP, Freed MD, et al. (September 2008). "2008 focused update incorporated into the ACC/AHA 2006 guidelines for the management of patients with valvular heart disease: a report of the American College of Cardiology/American Heart Association Task Force on Practice Guidelines (Writing Committee to revise the 1998 guidelines for the management of patients with valvular heart disease). Endorsed by the Society of Cardiovascular Anesthesiologists, Society for Cardiovascular Angiography and Interventions, and Society of Thoracic Surgeons". Journal of the American College of Cardiology. 52 (13): e1–142. doi:10.1016/j.jacc.2008.05.007. PMID 18848134.